From a chef at ITC Maurya and Grand Hyatt to now a successful restaurateur, Aman Puri has long been associated with the hospitality industry. Puri’s immense love for cooking and inclination towards hospitality made him shift from a chef to being the director of Imly and Duty Free. 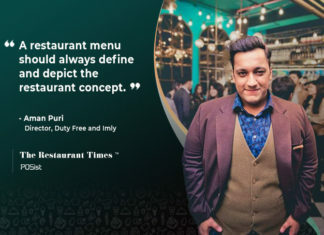 Chef Aman Puri is the man behind the uniquely innovative and widely popular Imly menu. Through the menu, he has managed to get the Indian street food under one roof successfully. He is a food innovationist, who courageously experiments and continuously tries to create something remarkable. The Imly menu is a perfect example of his culinary skills and competence, and Duty Free, on the other hand, provides the most contributive environment for de-stressing with a fresh design spirit. Cozy niches marked by wood, a combination of subtle browns with pop teal, tables topped off in flowing translucent strips are some of the most remarkable aspects of Duty Free. Aman Puri has left no stone unturned in making the Delhi population fall in love with street food all over again and has also combined it with quirky and colorful vibes which are no less than a lethal combination at Imly. On the other hand, Duty Free is designed to bring together the vibrant potential of youth, and the colorful vibe of the space creates a visual dialogue in itself. In an exclusive conversation with The Restaurant Times Aman Puri talks about the art of proper menu designing, the challenges of running a bar, the importance of technological bedding and a lot more. Menu Engineering is one of the critical factors that impact restaurant sales. According to Puri, the first step in designing a menu is analyzing the market and competition so that one can understand the taste palette of the audience and categorize the food accordingly. The menu should also define and depict the restaurant concept. The right categorization of food is of utmost importance as it assists customers to order not just the food of their choice, but also the items that are going to bring in high profit. It is always said that first, the food should appeal to the eyes and then the mouth. The food that is worth being clicked is what wins heart these days. One of the first involvement with food is how it looks and smells, so food presentation is of utmost importance. According to Puri, if a dish feels good and looks good, it already reaches the top. In recent years food presentation has become an important factor due to the rising growth of social media. Balancing the variety and contrast in plating is essential. ‘Matching the portion size to the plate of choice is also important. You don’t want your food to get lost on a dish that is too large. Similarly, a smaller plate may make the portion size look too large and take away from the overall presentation,’ says Puri. According to Puri, to run a successful bar, it is vital to ensure that the bar is always well stocked. These days the availability of liquor from the excise department is generating a lot of problems. Brands like Bira, Budweiser are not available easily, and these are the highly demanded brands. Keeping the bar stocked goes far beyond than just filling your back bar cooler or refrigerator with beer, liquor, and wine. It is essential to cater to the customer demands and proper forecasting of sales helps in achieving this. Another prominent challenge in running a restaurant and bar is related to the inventory pilferage. According to Puri, a bar has a lot of thefts and pilferages, and so it is essential to check references and have a background check before hiring bartenders and other staff members. A close check can bring out dishonest candidates with a history of theft and alcoholism. This is useful in creating a team of dependable workers who are unlikely to steal liquor. The restaurant business is a competitive space, and one of the keys to success in the industry is great customer service. According to Puri, one of the primary concern is ensuring accuracy and precision at the checkout point. With a restaurant-specific POS system, terminals are connected through a standard interface. When your wait staff inputs an order to their workstation or via a hand-held device, the ticket becomes accessible at all points throughout the system. This improves efficiency in the operations and also helps in processing orders faster. Restaurant-specific POS systems allow for the real-time tracking of inventory, with the dedicated software recording the projected usage of all ingredients as each order comes in and is prepared by the kitchen. This actual time tracking increases productivity, making it easier to deflecting the over-ordering of perishable materials that can so quickly lead to waste. Aman Puri concludes by saying that customers can expect Imly at Murthal soon and six more outlets of Duty Free all around Delhi.